Once upon a time there was a world of tragic princes who had been transformed into small amphibians, beautiful princesses who were temporarily languishing in a life of drudgery, unprepossessing trolls with rights-of-way issues, and a variety of woodland wildlife with surprisingly philanthropic attributes. 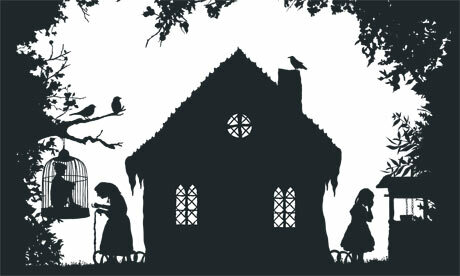 All this week the Guardian is giving away booklets of our best-loved fairytales (that can also of course be read on the web), with their contemporary resonances discussed by the modern writers who have selected the stories for publication. But the deeper you venture into the dark woods of these fairytales, the more you have to wonder – are these stories really for kids? Maybe I should post my article about the devolution of Little Red Riding Hood here? It appeared in Apex a year or so ago … now, where did I put that file? This entry was posted in On Writing: General, Random and tagged apex, fairy tales, guardian uk books, horror, little red riding hood. Bookmark the permalink. Beeso – you have just earned my undying affection. Angela – Brain # 2 sounds like a brilliant entity. As for just sending ONE story, you should send your entire backlist. I confess to having read nothing by Terry P.
Brian 2 is Lisa Hannett, my Clarion South bud and brain extension. 🙂 The LRRH thingy is actually an article. Shall see if I can find it. *sigh* Wanders off to find TP.